Among other events, stories like the ones prior to this represent the entire Love/Hate relationship landscapers have with the weather. Of course we have general problems also with Nature as well as the assigned time pressures of construction in general. Ironically, this last tale is an easy one but no less epic. It represented my first real encounter with the wonders of a miracle cure for all which ails the wet and miserable: washed sand. 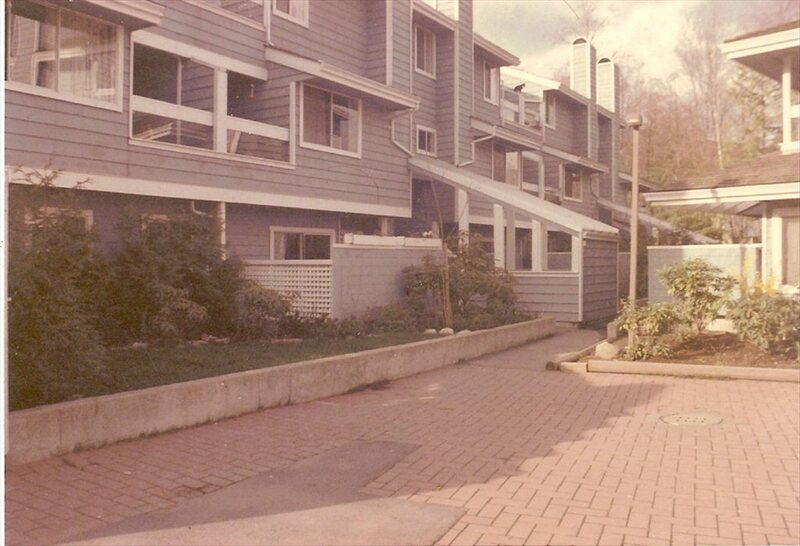 The picture above is the finished look – 7 years after the project was completed – of a project in North Vancouver, BC which was also a government-sponsored housing Co-op. 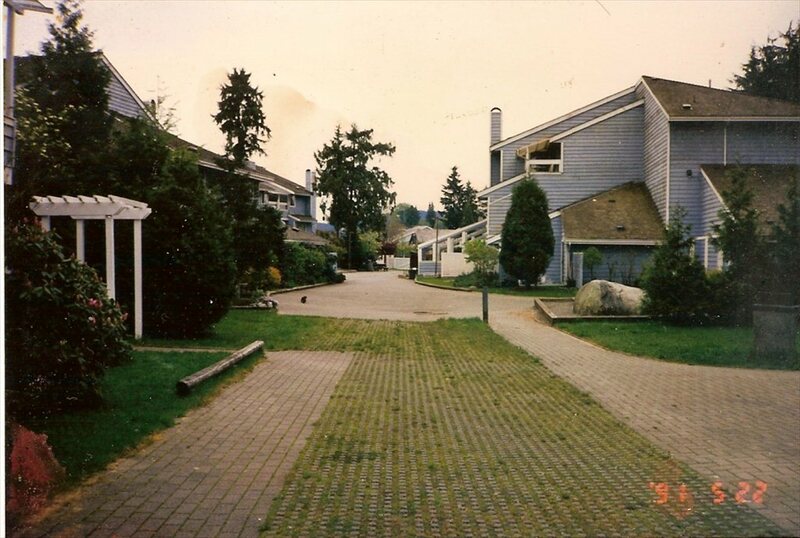 It shows about 1/3 of the length of the “Fire Lane” – a 20′ wide course which would be used only in the event of fires and which, of course, was also used regularly (in reality) for purposes of moving in and out. The concrete material in the foreground is called “Turfstone” and is used where there is a desire to feature a lawn but to still be able to drive a 40 ton fire truck on top of it without sinking up to the gunwales. 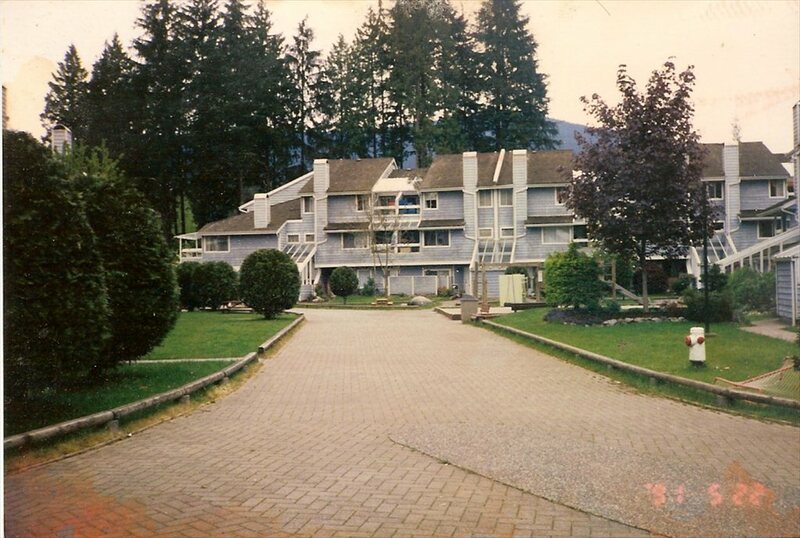 Interestingly, at least for this project, the determining qualification in testing the Turfstone and brick was a matter of the Fire Department bringing in a 40 ton truck and driving on the suckers. None of that fancy Uranium business for these guys! We passed. Here is a look backwards at pretty much what the other photo was gazing at. The Turfstone bit is around the corner to the left on the way out of the development. As we can see, this is one long stretch of brick, mixed with cement features as well as some asphalt as we’ll see soon. It also goes to the right – Eastward – for an equally long stretch. This picture is taken at the halfway point, where the path makes a 90 degree turn. All-in-all, the brick and Turfstone elements stretched about a quarter mile. It was the second-largest brick project I ever did, including doing 55 different driveways at a development in Reno. This one was huge. So – where’s the mud? Well, the mud greeted us, the truth is. We began this job in pretty much the dead of Winter, with consistent and daily rainfall of one sort or another. Not only that, but the buildings shown here were in the very early framing stages, while the other buildings – where we began – were more or less done; certainly enough for us to get underway. I regret to mention all the photographic record I have from this project are ‘after completion’. I say this because of the missing humor and “perplex-ment” value because the beginnings were a most curious and bizarre process. (As a brief “aside”, I also mention the nearby buildings undergoing the primitive framing stage of development as background to an event I also never experienced again. I had a flat tire on a Bobcat we were renting. The guy came up, changed the tire and took the flat back to his shop for repair, leaving us movin’ on with a newly fixed tire. The guy called me later. OK, it was funny: “Hey, Steve, you guys did something I never saw the likes of! You had 138 nails in that daggone tire.” ……..who……..me??? 😉 True story! This cloudy “after shot” shows where we encountered a most unpleasant and hardly-“ready” hole in the ground about the approximate size of Texas. 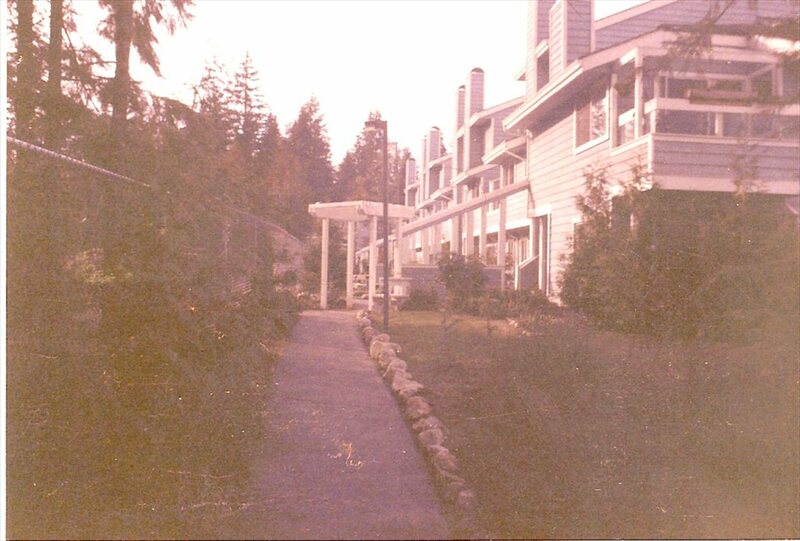 This calm, domestic little scene was once a gaping wound, 50 feet circular and 16-20 feet deep, a remnant of a misplaced excavator who dug the underground parking excavation – supposedly under the buildings – some 50 feet in the wrong direction. It also extended some 20 feet smack into the area where the pavement was slated to go. Ignored and filled with rainwater from the origins of the project, we encountered it in its full gory glory. Typically, the contractors we work for supply a graded edifice for us to adjust slightly – it’s always a part of the deal. But this time, we faced a situation so gross, it was to laugh. Naturally, I told the contractor to, ahem, “Fill the hole!”. He replied by asking me to. It was an “extra”, of course – they had elements of civilized behavior after all. But, for the life of me, this impediment was unique. It was a gosh darn swimming hole, for Pete Sakes. The problem was, they wanted it paved over within 2 weeks! I called a few experts, all of whom agreed on a solution: washed sand. I had the father of a friend who worked for the BC Highways as an engineer confirm this as a good effort, so I started calling sand suppliers. The next day, I began greeting trucks and pups (extra trailers) in a long line of eventually something like 36 truckloads of sand. They would dump the sand in a pile and I would take the Bobcat, push the stuff and dispense with it in about 5 minutes, pushing the sand onto increasingly stable land-reclamation. Definition of “washed sand”: Washed sand is surface mined, screened and washed to remove silt and clay, then allowed to drain. It is typically alight buff color, almost off-white. Washed sand is a finely graded sand and can be used for fill, to topdress golf course greens, and as a base for laying brick and pavers. The sand would be oozy and pure liquid at first contact with the water. As we raised the level oh so gradually, the moisture was always there but another load on top would reveal an amazing stability. Inching our way upwards – with sand floating at the outer reaches of the expanding pile – the water could be seen spilling out in monstrous amounts as the level rose, back into the forest where we had cut a small creek to handle it earlier to get to a decline not too far away. At about the 25 truckload level, we were still 6 feet below where we would eventually rise to and I found myself tipping a bit too frisky, shooting down on top of the stuff, and I panicked. It was here that I had the amazing sense of “Eureka – this is going to work!” Cascading downwards, slipped off into the “abyss”, I actually found myself supported – not sinking. In fact, as I tried the white knuckle experience of seeing water from a shielded area joining me – and as my guys were trying to get me chained up to a backhoe to yard me out – I reversed the machine and I actually found myself climbing back out. It did require the chain, however, as my tires began digging into the sand but I got pulled out easy enough. When this minor episode finished, I got out of the cab and stood up, smiling. Oh, and shaking a little. It was a true epiphany concerning eventual success. What shocked me most, to be honest, was how easy it was and I’m being serious. This stuff was a wonder. We filled it in a day. Within 3 days of beginning the “fill” we were running a big heavy “double drum roller”, complete with vibrations over the entire area as if it had always been there. The sheer volume of water and its 100% saturation of the lower levels of the sand provided an incredible compaction, just all on its own. Since that event, I have had occasion to call for washed sand in dealing with mud and water on many occasions. For purposes of pure traction in slime, washed sand, piled up sufficiently to travel on, makes an incredibly easy and practical solution where things seem impossible. Add that, later, as things dry up, the sand is an excellent drainage-enhancing soil amendment when disbursed around while getting back to grade, it shines even more so. This entry was posted in Construction Pictures/Progress, Stories, The Landcaping Trade Itself by Steve. Bookmark the permalink.